Farooque Ahmed, the man arrested Wednesday in connection with a plot to attack the Washington, D.C., subway system, had at least one associate who remains at large, an FBI agent indicated in an affidavit released Thursday. Ahmed, a native of Pakistan who is now a U.S. citizen, first came to the FBI's attention in January when Ahmed and an unnamed associate "were inquiring about making contact with a terrorist organization in order to participate in jihad by traveling overseas to fight coalition forces in Afghanistan and/or Pakistan," FBI agent Charles Dayoub said in the affidavit. That unknown associate also traveled with Ahmed in July as he rode on the Washington Metro in northern Virginia to scout sites for a potential terrorist attack, Dayoud wrote. 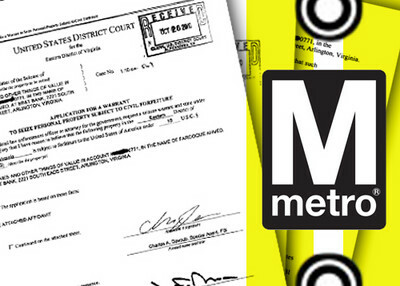 "FBI agents later observed them returning to the Arlington Cemetery Metrorail station and boarding a train," Dayoud's affidavit says. Ahmed, the document says, believed he was working with operatives of al-Qaida, the terrorist group responsible for the 9/11 terrorist attacks. The arrest of Ahmed, 34, comes as federal and international law enforcement officials are tracking what they consider signs of increased terrorist activity. IPT News reported Thursday that a federal law enforcement official said there are multiple investigations of radical Muslims who are believed to have received training or direction from Pakistan-based terrorist groups in order to carry out attacks here. Dayoub's affidavit does not specify how the FBI learned Ahmed and his associate were inquiring about contacting a terrorist organization in order to fight overseas. Once the FBI learned of Ahmed's interest, however, agents contacted him in April and told him he could "meet an individual that Ahmed believed to be a representative of a terrorist organization at a hotel near the Washington-Dulles International Airport on April 18, 2010." The FBI affidavit also says an unnamed operative passed a Qu'ran with coded messages in it to Ahmed. Beyond scouting a series of northern Virginia Metro stops frequently used by military personnel for potential attacks, he was also casing an unnamed Washington hotel for another attack, the affidavit says. Ahmed said the Arlington Cemetery, Courthouse and Pentagon City subway stops and the hotel were "good targets that contained many people." The targeting of mass-transit stations and hotels resembles the November 2008 attacks in Mumbai, India. Over a period of 60 hours, 10 terrorists with the Pakistan-based Lashkar-e Tayyiba held the city hostage; carrying out a series of bombings and shootings in luxury hotels and transit centers, and killing 172 and wounding hundreds more. Since that attack, one of the biggest concerns has been the possibility of another Mumbai-style fedayeen attack in another Western city. The New York Police Department recently conducted a drill to prepare for a simulated attack on civilians in Manhattan's financial district. The increasing concern over the threat of homegrown terrorism is real, the federal law enforcement official told IPT News, and said evidence for signs of wider activity comes from four categories. Actual tracking of foreign terrorist recruiters, including some with U.S. passports, who have been sent here to select terrorist candidates to carry out major attacks in the United States. Evidence showing a substantive increase in international travel by terrorist operatives into the United States and Europe. They have either been dispatched by al-Qaida-linked groups, or are "lone wolf" types who have connected to groups in both Pakistan and Yemen to volunteer to carry out attacks. A substantial increase in the "terrorist chatter" that has preceded previous major attacks. The capture and interrogations of key Islamic terrorists by U.S. allies who have revealed details of plots and names of operatives who have been sent or trained to carry out attacks. · The FBI affidavit said Ahmed "wished to fight in jihad himself, and that he has trained to do so using various firearms." Ahmed, the report said, either used or purchased rifles and a shotgun and had also studied martial arts and "knife and gun techniques" in preparation for going to Afghanistan to fight U.S. forces there. Strangely, the US govt is planning to remove some of the Taliban affiliates from the list of terrorist organizations! I certainly hope the USA is smart enough to revoke this guys citizenship. He has no right to be an American. I also hope they execute this piece of excrement as it would send a message to the Islamic world that we are no longer going to tolerate this behavior.